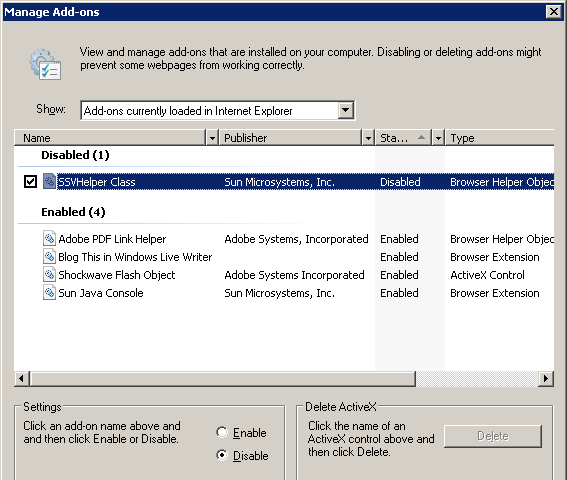 Dan Dar3: IE7 slow to open - fix? I couldn't find much information about SSVHelper, other than being part of the Sun JRE (1.5 and greater), but nothing specific about it. I'm not running Java applets very often and if I'll find they don't work, I'll just keep it in mind and enable it back when needed. 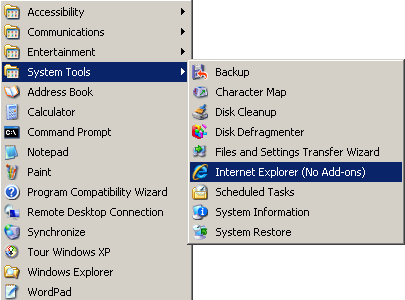 There is an easier way to check whether the add-ons are slowing the IE7 startup; go to Start > All Programs > Accessories > System Tools and run Internet Explorer (No Add-ons) - if that's starting quickly then you need to review the addons and disable anything that you don't need. Had same problem - thanks for post!! i'm glad it helped :-) just updated the post on how to start IE with no addons, might be helpful next time. I've never used the Google Toolbar - you should try Google Chrome, you might be surprised how fast it is and it displays websites pretty much like IE, although it doesn't support ActiveX controls. You could use IE for certain websites and Google Chrome for casual browsing. SSV was TOTALLY my problem. And my teammate's at work. We probably picked up that helper loading stuff to work on Java/JSF stuff at home. ssv.dll seems to be part of both Sun's JRE and JDK installations, so you are correct. My pleasure.